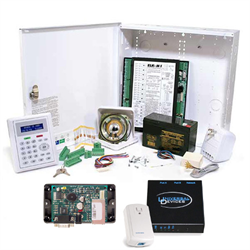 This is the ultimate M1 Gold Insteon Starter Kit combining the power of the Elk M1 Gold, the ISY994i Insteon controller, with Elk Internet module for powerful alarm features, total Insteon lighting control and Internet access/notifications. Call in to your house to control your alarm and even your lights! The M1 Gold is perfect for your home, cottage, vacation home or business. With 16 standard wired alarm zones, it supports all standard alarm contacts, wired smoke and CO detectors, with 13 on-board outputs for extremely flexible automation functions. Supports Elk, GE, Resolution or Honeywell wireless sensors and fobs. See below for links. The M1 Gold can be self monitored by phone with voice prompts, pager or email. And/or it can be monitored by a monitoring station. Receiver notifications on alarm events, automation rules or any system condition. The M1 Gold offers a host of futuristic features and the stability of a hardware based security & automation system. The 500+ word vocabulary pleasantly announces system status through the included speaker or over the telephone. Note: This kit allows the Elk system to control Insteon. There is also an optional Elk module for the ISY994 that allows the ISY to monitor and control Elk. This is purchased separately directly from the ISY dashboard after install. Sells for around $99. this module is NOT required but is a nice upgrade. Create lifestyle enhancing comfort, convenience and security with powerful "When/And/Then" RULES Programming allowing almost any imaginable operation.